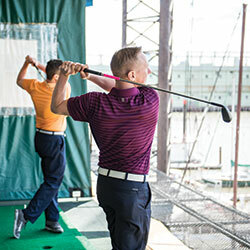 The Golf Club at Chelsea Piers, Manhattan's only four-tiered, year-round outdoor driving range, offers the unique opportunity to hit full shots, practice putting and take lessons from top golf professionals. Located on a scenic Hudson River pier, this four-tiered "super-range" features a 200-yard fairway, a full-service teaching academy, Full Swing simulators, and a membership program for frequent golfers. No buckets of golf balls here! The Golf Club's driving range uses a Computee RC20000 series automatic ball tee-up system designed and used in Japan. Purchase a ball card, insert it into your hitting stall's card reader, and golf balls begin to tee-up. The driving range target greens and putting green, located just outside the entrance to the Golf Club, are both furnished by MetroGrass, which is powered by FieldTurf. New to the game of golf? Check out this video of Senior Teaching Pro Steve Bourbon giving a lesson to Aly Teich, Founder and Host of The Sweat Life. 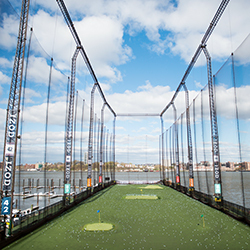 The Golf Academy at Chelsea Piers is New York City's most high-tech indoor training center, featuring a variety of schools and private/semi-private instruction for novice to accomplished golfers. Junior Programming for children ages 4 - 16 years and a competitive Golf League for adults are also available. The 2,000 square-foot state-of-the-art Academy features hitting stalls, a practice sand bunker, an indoor putting green and chipping area, JC Video swing analysis, K-Vest motion capture software, Quintic putting system, the Flightscope launch monitor and two Full Swing simulators. The Golf Academy also boasts 12 teaching professionals, including PGA and LPGA certified instructors, who offer a wide array of talents and personalities, giving each golfer the opportunity to find a unique match for his or her learning style and pace. Instructors work with golfers of all levels to improve techniques and strategies and to build confident mental attitudes. Though the Golf Club is open to the public, annual memberships are also available. Membership benefits include reservation privileges on the driving range, access to private locker rooms, various discounts on Golf Club and Academy purchases, guest privileges and more! Click here for more information on membership. With its riverside views and country club setting, the Golf Club is a unique location for events of all kinds. The Golf Club offers a range of interesting and fun event formats and programs to fit a variety of client needs. The Event Sales Team can customize any event, including large scale corporate outings with professional instruction and reception, conference style meetings, bachelor parties, "Guys Night Out" in the Full Swing Simulators, and even children's birthday parties. Click here to learn more.